Perhaps you’ve relied on your bank to advise you on your investments, or taken out a GIC or RRSP with them. But have you considered investing in your bank itself? 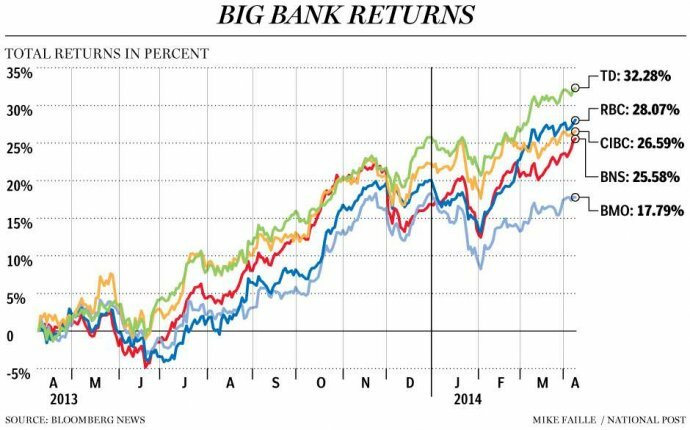 Bank stocks are a popular investment that commonly pay dividends. And, according to a new report released by RBC Capital Markets, they’re expected to do well over the next year, climbing between eight and 19 per cent. But don’t toss all your savings in just yet – there are several elements to consider beforehand when investing in bank stocks, says Kim Inglis, an investment advisor and portfolio manager with Canaccord Genuity Wealth Management. Bank stocks are especially sensitive to overall economic fluctuations, moreso than stocks in other unrelated sectors. “Before investing in banks or any stocks for that matter, investors should assess their overall tolerance for risk, ” says Inglis. In other words, write down the maximum dollar value loss you could deal with in the event that things go south for you. Can Your Savings Keep Up With Price Swings? While the financial sector is notorious for being more stable than other sectors – and Canadian banks are among the safest in the world – it certainly isn’t immune from price swings and market influence. A slowing economy and the ebb and flow of the housing sector are also tightly linked to bank stocks. Mortgage loans are expected to remain the biggest source of income for banks, though volume has declined since 2011 due to tougher market conditions, slower sales and rising mortgage rates. With that being said, Canadian banks have a solid track record. According to Canaccord Genuity analysts, there is reason to believe the financial sector will perform well – much in line with RBC’s forecast. When an economy is set to recover but policy rates are anchored by the central bank, the net result is typically a steepening of the bond-yield curve. Ultimately, this is positive for banks’ net interest margins and profitability, says Inglis. Also, Canadian bank earnings should benefit from strengthening capital market returns and wealth management operations. Although the housing market and overall economy can indicate the state of bank stocks, Inglis cautions against their use as a concrete barometer.